1 x Yoga Ball. Note: Light shooting and different displays may cause the color of the item in the picture a little different from the real thing. Size: 90 45 cm. Features: 100% Brand new and high quality! 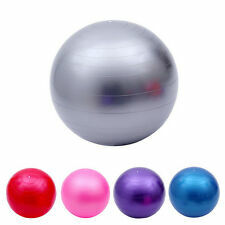 This fitness yoga exercise ball can help you achieve muscle and tension release for all parts of the body The surface also promotes sensory stimulation and is perfect for body dexterity exercises This yoga exercise ball is made of durable material for long time use Compact design can be used at work, play, home, or sports This fitness exercise ball can be enjoyed and used by anyone, from children to the elderly and the disabled Specifications: Dimensions: 90 x 45cm (L x W) Max Bearing Weight: 7054.79 oz / 200000g Material: PVC Package Includes: 1 x Yoga Exercise Ball . Material: PVC material Size: 90 * 45 cm. Weight: 900 g. Color: p Included: 1 x Ball 1 x Inflator pump Note: Light shooting and different displays may cause the color of the item in the picture a little different from the real thing. The measurement allowed error is /- 1-3cm. UPC 191466106853 EAN 191466106853 IABN 191466106853 MPN Does not apply Brand Unbranded. Material: PVC material Size: 90 * 45 cm. Weight: 900 g. Color: p Included: 1 x Ball 1 x Inflator pump Note: Light shooting and different displays may cause the color of the item in the picture a little different from the real thing. The measurement allowed error is /- 1-3cm. Brand Unbranded MPN Does not apply UPC 191466121719 EAN 191466121719 ISBN 191466121719. We hope cooperate with you in the future. We will do as we promised for you. Product Size: Weight: about 250 grams. Balancing Stability Ball, Perfect for yoga or pilates exercises. Size: 45CM. 1 x Balancing Stability Ball. Note: Light shooting and different displays may cause the color of the item in the picture a little different from the real thing. Overall size: (inflated) about 80x45cm. 1 x Yoga ball. Features Peanut Shape. increase blood circulation, strengthen heart and lung function! Activity Gym & Training. suitable for sisters with fat belly, thick arms and legs! 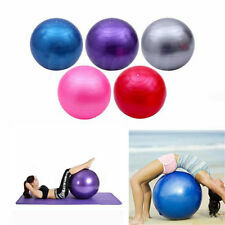 100% Brand new and high quality Balancing Stability Ball, Perfect for yoga or pilates exercises. Size: 45CM Color: Red Quantity: 1 pc Package Contents: 1 x Balancing Stability Ball Note: Light shooting and different displays may cause the color of the item in the picture a little different from the real thing. The measurement allowed error is /- 1-3cm. MPN Does not apply Brand Unbranded UPC 190268870955 EAN 190268870955 ISBN 190268870955. Balancing Stability Ball, Perfect for yoga or pilates exercises. Size: 45CM. 1 x Balancing Stability Ball. 1 x Yoga Ball. Note: Light shooting and different displays may cause the color of the item in the picture a little different from the real thing. Size: 45 cm. Color: Blue Size: 45 cm Package included: 1 x Yoga Ball 1 x Air Pump Note: Light shooting and different displays may cause the color of the item in the picture a little different from the real thing. The measurement allowed error is /- 1-3cm. MPN Does not apply Brand Unbranded UPC 190268871372 EAN 190268871372 ISBN 190268871372. Easy to grasp.These balls have hundreds of nodules for extra sensory stimulation. Can be inflated with two way ball pump. Easy and fun to use on yourself or a partner. Easy to grip in water. Ideal for finger and grip exercises. Fitness Mad FBALL45 300kg Swiss Workout Exercise Training Ball - 45cm. Model FBALL45. Those under 5'6 - 5'10. Peanut ball for labor - A comfort tool to help labor progress, for labor and birth support. The peanut ball doesn't slip, slide or flatten like pillows, keeping a mum's legs properly supported and the pelvis open. 8X(Material: PVC material Size: 90 * 45 cm. Weight: 900 g. Color: pink Included: 1 x Yoga Ball 1 x Inflator pump Note: Light shooting and different displays may cause the color of the item in the picture a little different from the real thing. The measurement allowed error is /- 1-3cm.) MPN Does not apply Brand Unbranded EAN 191466121719 UPC 191466121719 ISBN 191466121719. 10X(Material: PVC material Size: 90 * 45 cm. Weight: 900 g. Color: pink Included: 1 x Yoga Ball 1 x Inflator pump Note: Light shooting and different displays may cause the color of the item in the picture a little different from the real thing. The measurement allowed error is /- 1-3cm.) MPN Does not apply Brand Unbranded EAN 191466121719 UPC 191466121719 ISBN 191466121719. 1 x Yoga ball. Suitable for sisters with fat bellies, thick arms and legs! Color: Gray. Overall size: (inflated) about 80x45cm. 1 x Yoga ball. Features : Peanut Shape. increase blood circulation, strengthen heart and lung function! Activity : Gym & Training. suitable for sisters with fat belly, thick arms and legs! Model FBALL45. Fitness Mad 300kg Swiss Ball Ideal For Yoga Pilates Physiotherapy Training 45cm. Those under 5'6 - 5'10. No pump or DVD supplied.